Objective : The aim of this study was to describe infantile presentation of isolated absence of RPA along with a brief review of the literature. Results : Five patients were identified with this anomaly. The median age of presentation was 86 days (range, 40-120 days) and the median weight was 3.65 kg (range, 3.1-5.5 kg). All patients presented with breathing difficulty and had severe pulmonary hypertension (PHT) along with absent RPA on echocardiography. A multidetector computed tomographic scan was performed to confirm the diagnosis in four cases. Three patients had major aortopulmonary collateral and the hilar RPA was not well developed in all. A correct diagnosis was made before referral in one patient only. Differential vascularity in chest X-ray, a useful clue, was seen in four of five cases. Surgical correction was not considered in view of the small hilar pulmonary artery. The patients were all managed medically with diuretics and Sildenafil. Conclusion : Isolated absence of RPA is a rare congenital abnormality with varied presentation. Infantile presentation is marked with congestive cardiac failure and PHT. Specific diagnostic clue includes differential vascularity on the chest X-ray. Isolated absence of RPA frequently presents in infancy with PHT and congestive cardiac failure. , A high index of suspicion is required to diagnose this condition in infancy. , We present a series of five infants along with a brief review of the literature. We retrospectively reviewed the medical records of children who presented with severe PHT from April 2007 to October 2009. Patients with isolated absence of RPA were identified and reviewed in detail. Patients associated with other congenital heart defects were excluded. In a period of two and half years, we had five patients diagnosed as isolated absence of RPA. All patients were infants between 40 and 120 days old (mean age, 85 days) at presentation, weighing 3.1-5.5 kg (mean weight, 3.99 kg). Four out of five of the patients were referred as unexplained cases of severe PHT. All infants had echocardiogram performed in the referring hospital. Only one of the patients was referred with diagnosis of absent RPA and severe PHT. The clinical presentation of the patients was similar [Table 1]. All had tachypnea at the time of presentation and had clinical features of PHT. Electrocardiogram showed sinus tachycardia, rightward QRS axis and right ventricular dominance. X-ray of the chest [Figure 1] in the posterior-anterior view showed differential vascularity in four out of the five babies, which was an important clue. 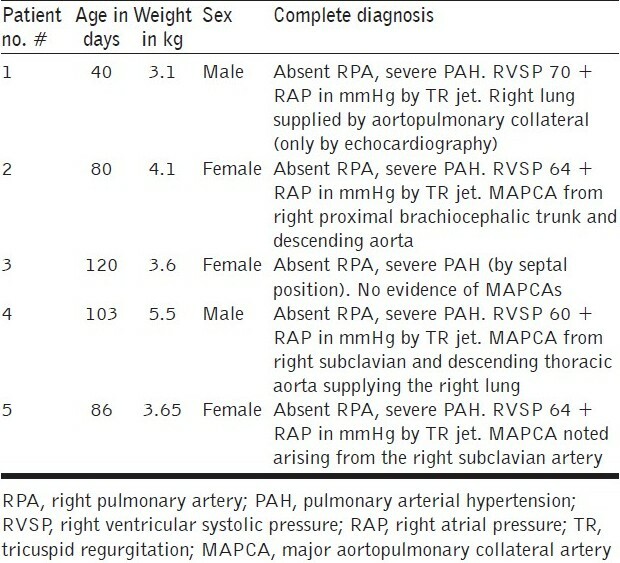 Initial echocardiographic evaluation showed severe PHT and the RPA was found to be absent in all of them [Table 1]. A cardiac multidetector computed tomographic (MDCT) scan was carried out in four patients to confirm the diagnosis and to define the pulmonary artery anatomy. The hilar pulmonary artery was not well developed [Figure 2]. Three patients (Patient# 2, 4 and 5) had major aortopulmonary collateral artery (MAPCA) detected by the MDCT scan. Patient# 1 had suspicion of collateral on echocardiography, but an MDCT scan was not performed. Patient# 3 had no significant collateral on the MDCT scan [Table 1]. The hilar pulmonary artery was very small in the babies and thus surgical correction was not considered. The babies were treated symptomatically with frusemide (1 mg/kg twice daily), spironolactone (2 mg/kg/day) and Sildenafil (1 mg/kg/day). On follow-up (mean 12 months), three of the four babies were symptomatically stable with decongestive medication and Sildenafil. All had persistent PHT. One patient was lost to follow-up. Isolated absence of RPA is a rare disease. Bouros et al. described the prevalence by analyzing the chest radiograph of 600,000 army recruits and found a prevalence of 1 in 200,000. The study was carried out in the healthy, adult population. The true prevalence of the disease in children is not known. The entity of unilateral absence of pulmonary artery was reviewed in three publications covering different time era in the last ~60 years. Pool et al. reviewed 32 cases before 1962 whereas Shakibi et al. studied 47 cases from 1962 to 1976. Hankel et al. added a review of 107 cases from 1978 to 2000. RPA was absent in 56-63% of the cases in these three case reviews. Cucci et al. opined that absence of RPA was more frequently seen in an otherwise normal heart and absence of left pulmonary artery was accompanied by additional cardiac lesion. This fact was not supported in the analysis of 186 cases in three series. ,, All the five infants in our series had absent RPA, which could be a simple coincidence. The diagnosis of isolated absence of RPA is based on history, clinical evaluation and imaging. A high index of suspicion is needed to make the diagnosis. In infancy, the signs can be subtle and can be easily missed. ,, Four of the five cases in our series were diagnosed as a case of unexplained severe PHT after echocardiography in the referring institution. Chest X-ray may show an absent hilar shadow, absence of the left or RPA, reduction of pulmonary vascular markings on the right side (~60% cases), a small hemithorax and intercostal bone space, shrunken affected lung and a shift of the mediastinal structures to the affected side with contralateral lung hyperinflation. ,, A cardiac MDCT scan [Figure 2] and magnetic resonance imaging (MRI) can confirm the diagnosis and delineate the pulmonary artery anatomy along with delineating MAPCA if present. Any infant with unexplained PHT should be thoroughly evaluated for the possibility of isolated unilateral absence of pulmonary artery (UAPA). Differential vascularity on the chest X-ray may often be a clue for the diagnosis. Four of the five patients in our series had diminished vascular marking on the affected side [Figure 1]. If the intrapulmonary arteries are well developed, a primary anastomosis with the central pulmonary artery can be made. If the intrapulmonary branches are small, a modified Blalock-Taussig shunt can be used. This allows a better growth of the affected intrapulmonary arteries before the segments are connected with the main pulmonary artery during subsequent surgery. , Other surgical options are an interposition tube graft with autologous pericardium or prosthetic material and mobilization with end-to-side anastomosis of the affected artery to the main pulmonary artery. The hilar pulmonary artery in the infants of our series (four patients) was very small and hence surgical correction was not considered. Isolated absence of RPA is a rare entity. In infancy, it presents with respiratory distress and severe PHT. A high index of suspicion is needed to diagnose the entity. Differential vascularity in the chest X-ray can give a clue. MDCT scan and MRI can confirm the echocardiographic diagnosis and delineate the pulmonary artery anatomy. The surgical treatment plan depends on the presence of a good-sized hilar pulmonary artery and the presence of MAPCA. Early surgical or hybrid intervention may improve survival. Medical management includes symptomatic treatment for congestive cardiac failure and long-term pulmonary vasodilator for PHT. Infants with severe PHT are difficult to treat and have an unfavorable outcome. 1. Frentzel O. Ein Fall von anormer Communicationder Aorta mit der Arteria Pulmonalis. Virchow's Arch path. Anat 1868;43:420-2. 2. Pool PE, Vogel JK, Blount SG. Congenital unilateral absence of a pulmonary artery. The importance of flow in pulmonary hypertension. Am J Cardiol 1962;10:706-32. 3. Ten Harkel AD, Blom NA, Ottenkamp J. Isolated unilateral absence of a pulmonary artery. Chest 2002;122:1471-7. 4. Shakibi JG, Rastan H, Nazarian I, Paydar M, Aryanpour I, Siassi B. Isolated unilateral absence of the pulmonary artery. Review of the world literature and guidelines for surgical repair. Jpn Heart J 1978;19:439-51. 5. Bahler RC, Carson P, Traks E, Levene A, Gillespie D. Absent right pulmonary artery: Problems in diagnosis and management. Am J Med 1969;46:64-71. 6. Bouros D, Pare P, Panagou P, Tsintiris K, Siafakas N. The varied manifestation of pulmonary artery agenesis in adulthood. Chest 1995;108:670-6. 7. Apostolopoulou SC, Kelekis NL, Brountzos EN, Rammos S, Kelekis DA. "Absent" pulmonary artery in one adult and five pediatric patients: imaging, embryology, and therapeutic implications. AJR Am J Roentgenol 2002;179:1253-60. 8. Cucci CE, Doyle EF, Lewis EW Jr. Absence of a primary division of the pulmonary trunk: an ontogenetic theory. Circulation 1964;29:124-31. 9. Haworth SG, de Leval M, Macartney FJ. Hypoperfusion and hyperperfusion in the immature lung. Pulmonary arterial development following ligation of the left pulmonary artery in the newborn pig. J Thorac Cardiovasc Surg 1981;82:281-92. 10. Haworth SG, McKenzie SA, Fitzpatrick ML. Alveolar development after ligation of left pulmonary artery in newborn pig: clinical relevance to unilateral pulmonary artery. Thorax 1981;36:936-43. 11. Rubin E, Strauss L.Congenital absence of the right pulmonary artery. Report of a case in a five month old infant, with suggestive evidence of unilateral pulmonary hypertension. Am J Cardiol 1960;6:344-50. 12. Mimura S, Kobayashi H, Shinkai M, Kanoh S, Motoyoshi K. A case report of congenital isolated absence of the right pulmonary artery: bronchofibrescopic findings and chest radiological tracings over 9 years. Respirology 2005;10:250-3. 13. Marchau F, Boshoff D, Gewillig M, Mertens L. Excluded right pulmonary artery in a neonate. Eur J Pediatr 2004;163:274-6. 14. Welch K, Hanley F, Johnston T, Cailes C, Shah MJ. Isolated unilateral absence of right proximal pulmonary artery: surgical repair and follow-Up. Ann Thorac Surg 2005;79:1399-402. 15. Krammoh EK, Bigras JL, Prsa M, Lapierre C, Mirσ J, Dahdah NS. Therapeutic strategies in children with an isolated unilaterally absent proximal pulmonary artery. Pediatr Cardiol 2010;31:607-10. 16. Atik E, Tanamati C, Kajita L, Barbero-Marcial M. Isolated unilateral pulmonary artery agenesis: evaluation of natural and long term evolution after corrective surgery. Acq Bras Cardiol 2006;87:423-8. 17. Deutsch MA, Thieme SF, Hinterseer M, Johnson TR, Pfosser A, Reichart B, et al. 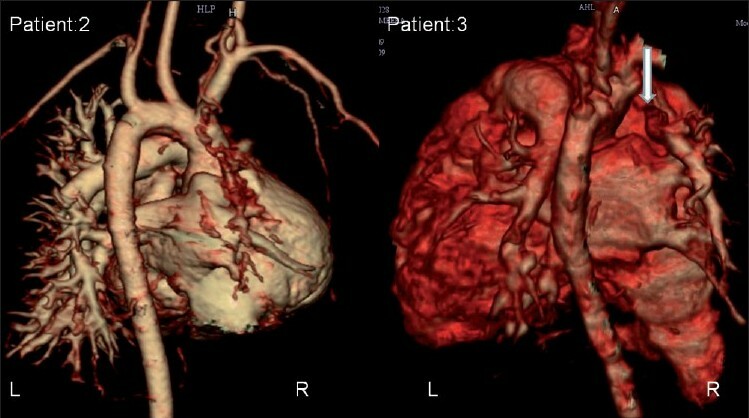 Adult presentation of combined unilateral atresia of the right proximal pulmonary artery and left patent ductus arteriosus: case report and embryological considerations. Int J Cardiol 2010;141:e4-7. BinnetoÇ§lu, K. and Ayabakan, C. and Sarisoy, Ã–. and Tokel, K.